This precious little church sits on a rise beside the busy Ixworth to Thetford road. If it wasn't for the little bellcote you might think it a barn or farmhouse, and pass by without a second glance. 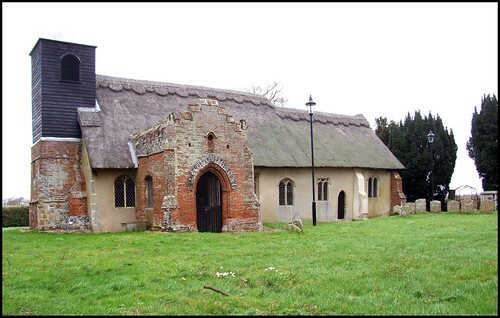 The roofline is memorable and attractive, the way the thatch covers over the transition between nave and chancel as if it was melting over them like soft cheese. The porch seems very extravagant for such a homely building, and is among Suffolk's best red-brick Tudor porches. It is so large inside that it is not hard to imagine its use for parish business. If you want to see inside All Saints, you'll need to get the key from the farm office across the road. It is only available on weekdays, unfortunately, not much help if you work full-time. A rather flustered lady who gave it to me advised me "not to hurry, I've got to work out how to turn the burglar alarm off." Peter and I pottered back up the hill and let ourselves in, expecting bells to sound at any moment, and Suffolk's Finest to arrive and feel our collars. But none of this happened. Instead, we stepped into the silence of a small country church which has not changed much in a hundred years; apart from the burglar alarm, of course. I remembered coming here some eight years previously, and there was the same sense of dust falling slowly through the air, as if the blacksmith and the ploughboy had just stepped outside for a moment. The Victorians restored well the sacramental integrity of the building, and you face east through narrow benches and boxes towards the three-sided 17th century communion rails, altar and east window above. Because of the low roof, and the lack of aisles and clerestory, this can be a dark interior on a gloomy day. Best to come here when the sun is shining, and the body of the church is filled with light. Thus illuminated, the bench ends come to life, and this is what Ixworth Thorpe is famous for. They are part of the same nationally important group as nearby Stowlangtoft and Honington. Most memorable is the figure variously described as a harvester and a thatcher. I think he is the latter. What a lovely example of 15th century East Anglian folk art! Nearby, a lady takes her lapdog for a walk, and a mermaid holds a mirror. Among the beasts are a unicorn, a horse and a hare. There is an owl to the west, and, I think, a cockatrice, who, unlike his twin in the chancel at Honington, retains his comb.The figures are attached to 19th century benches, and some of them are one-sided, suggesting that they were once against walls. The tiny 18th century pulpit has the familiar archway carvings, a contrast to the Victorian readers desk in the chancel, in the form of a fierce, lifesize eagle. Mortlock though it originally had a secular use. On the chancel wall hangs a table of matrimonial laws, which all churches had at one time. This would originally have hung in the porch, but under the guise of curiosa, has moved into the church. The simple little war memorial plaque is the work of Morris & Co. A George III royal arms looks down imperiously from above the tower arch. Everything is simple, but lovely. This is a wholly rustic space, at the heart of the fields and copses round about. There is no Ixworth Thorpe village really, and this scattered parish could not help but see its church on the hill as a focus of its identity. Inevitably then, it is a church of the ordinary people, with a sense of their continuity, and of its place in their community. It is little known, but should be celebrated. If only it was easier to visit!